Wow! 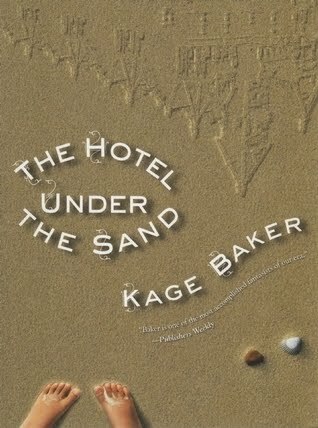 I read The Hotel Under the Sand with delight and joy. It's wonderful, wacky and spooky and serious and FUN. It also strikes me as utterly original (which is quite rare). In fact -- although this is something one should always say with some caution -- it wouldn't surprise me if it turned out to be a classic and went on down the ages along with Alice and Oz and the very few others that have become immortal. What could possibly make me more excited about this book? NOTHING. So, did it live up to DWJ's excessive praise? Short answer, yes. It was possibly one of the sweetest, funnest, most original chapter books I've ever read. There's one of the best ghosts I've ever read about, the coolest magical setting, and a super awesome treasure hunt. I mean, it starts with a girl washing up on an island and she immediately finds herself water and food and makes her own shelter! She's not helpless! It also made my heart so happy with its friendships and found family. I have no idea why this book hasn't found its audience yet but I'm going to work on changing that. Geez, why have I not read this yet? I enjoyed the Company books a while ago, and saw the DWJ blurb, but somehow never got around to reading the book. Your endorsement makes it even more necessary! It's just a magical little book. I hope you'll enjoy it! I've never heard of this one, and I've read the Company books twice! Going right on the wishlist! I'm reading the Company short stories in Black Projects, White Knights right now and Alec is feeling familiar in his strengths and initiative. She writes children in a non-standard way that I really enjoy! There really are hidden gems still to be found in the book world! You're off to a good start--I'd never heard of this book, but you can be assured that put getting my hands on it a priority! If I knew this book existed, I'd forgotten about it ages ago, and I never knew that Diana Wynne Jones had praised it. How excellent! Of course I will have to read it!